Hose is made with a seamless polyester inner tube along with braided high tensile strength fiber reinforcement. Series PF267NC has an Orange non-conductive (REACH Compliant), non-pin pricked cover. 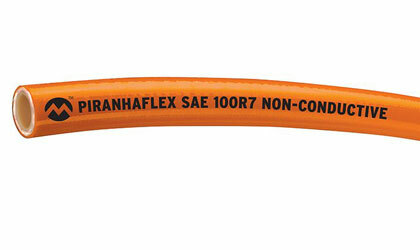 Hose features an improved flexural rigidity, up to 16% less force to bend vs competitive 100R7 type hoses. Improved kink resistance, up to 53% more force required to reach kink initiation vs competitive 100R7 type hose styles. PF267NC hose is ideal for medium pressure, non-conductive hydraulic hose applications in very tight areas. Click here for more info.